UPDATE Thursday – Video update from the National Weather Service from Thursday morning. UPDATE Thursday morning May 11 – Flood Watch in Effect Friday Morning through Saturday Morning for areas near and west of the Blue Ridge from Lynchburg to Wilkesboro. Visit this link for more information. Multiple rounds of showers and thunderstorms are expected Thursday through early Saturday. The heaviest rain is expected to occur Friday afternoon into Saturday. With saturated ground across the region as a result of repeated recent heavy rainfall, areal and river flooding, will once again become a concern. In addition, there is a marginal risk for severe thunderstorms across the area Thursday, with the main threat being quarter-sized hail. 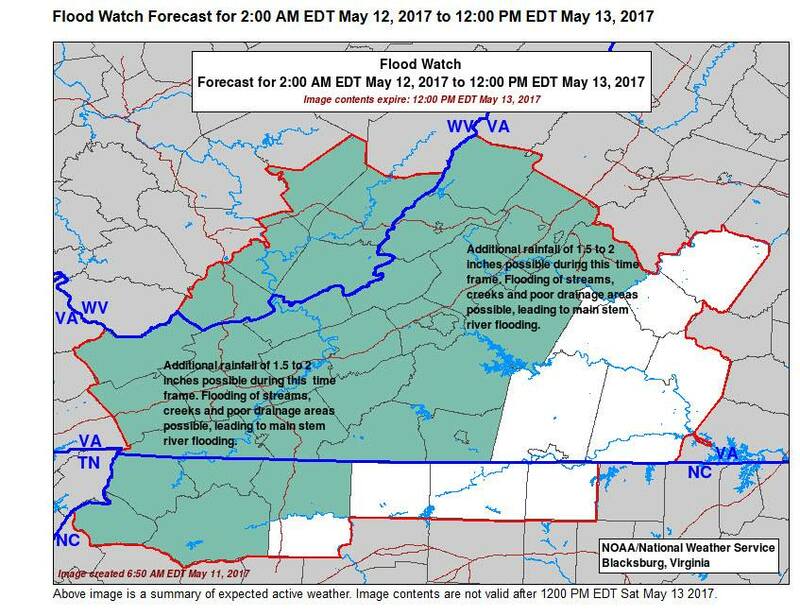 Thursday May 9 – With rain in the forecast everyday this week, officials with the National Weather Service (NWS) are monitoring the possibility for flooding in the High Country later in the week. There is the potential for river flooding Friday-Saturday and localized flash flooding Thursday-Friday, according to a Tuesday update from NWS. Since May 1st Boone has officially recorded 6.1 inches of rain, leading to the threat flooding conditions. Officials with NWS will update the threat as the week progresses and WataugaOnline.com will provide those updates here.